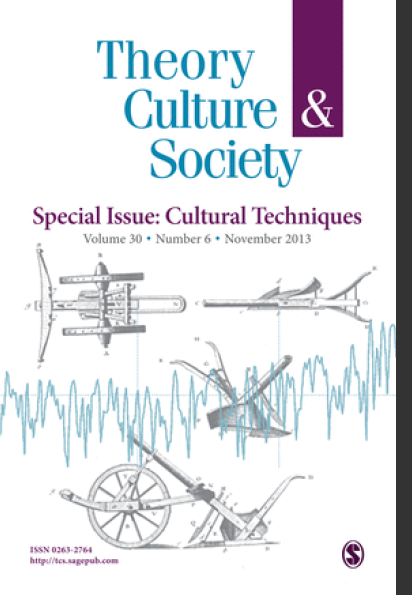 Our book-length special issue on Cultural Techniques (Kulturtechniken) is out. Co-edited by Geoffrey Winthrop-Young, Ilinca Iurascu and myself, the special edition in Theory, Culture & Society is a significant introduction to the term that stems from German academic discussions in cultural and media studies. One could say it offers a significant variation on themes familiar from postwar German humanities’ focus on media, technologies and epistemo-ontological questions of culture in a post-representational and post-textual mode. could not be thought without the mediation of a cultural technique. Key here is the way in which cultural techniques process distinctions with material and aesthetic means. In Winthrop-Young’s lucid words, “Procedural chains and connecting techniques give rise to notions and objects that are then endowed with essentialized identities.Underneath our ontological distinctions (if not even our own evolution) are constitutive, media-dependent ontic operations that need to be teased out by means of techno-material deconstruction.” The implications for a range of recent years of theory-debates are intriguing; it refers to the fact how we need to address practices of theory and techniques of theory as part of the work of concepts and philosophy of contemporary culture. Besides it also shows some early ideas that resonate with a post-textual approach to cultural analysis (for instance in Sybille Krämer and Horst Bredekamp’s article). I was asked to produce a short video abstract of my own contribution. In addition, find below the table of contents.